Öhlins 2.1 Steering Damper marks the latest evolutionary leap for handlebar mounted damper technology. Equipped with a new Uniflow valve system, the SD 2.1 controls the flow of hydraulic fluid in one direction and eliminates fluctuations of damping characteristics previously caused by changes in handlebar direction. The system is also pressurized to compensate for any temperature changes. Fits KTM 2016-19 SX/SX-F/XC/XC-F with rubber mounted handlebar clamps. Fits Husqvarna 2016-19 FC/FX/TC/TX with rubber mounted handlebar clamps. NOTE: You will need to drill and tap a 6x1.00 hole in the top of the triple clamp for the forward anti-rotation mount as shown here. On 2016 models with rubber mounted bar clamps, you will need to modify/replace your lower handlebar clamp in order to fit the Ohlins. We recommend the BRP replacement handlebar mount shown below. Or you can machine the stock lower clamp as shown in this image here. Replaces handlebar clamps on 2016-17 KTM/Husqvarna that came stock with rubber mounted bar clamps. Upgrades bolts from 10mm to 12mm, increases strength and replaces stock rubber cones with aluminum ones. Fits KTM full-size offroad models 2005-19, EXC/XC-W 2017-19. Solid mounted handlebar clamps. 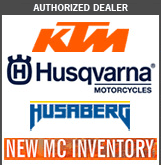 Fits Husqvarna 2014-19, FE/TE 2017-19. Solid mounted handlebar clamps. Damping Level Adjuster (DL) - Controls the general setup, including a high speed valve. Return To Center Adjuster (RTC) - Variable setup of the damping force on the return. click-feeling when adjusting the low speed damping. Damping force fading reduced significantly. Internal friction and wear minimized giving improved service life. Flat bottom for easier mounting on bike in either direction. Note: You will need to drill and tap a 6x1.00 hole in the top of the triple clamp for the forward anti-rotation mount as shown below: Note: Attention 2016 bridged lower handlebar clamp. You will need to modify/replace your lower handlebar clamp in order to fit the Ohlins. 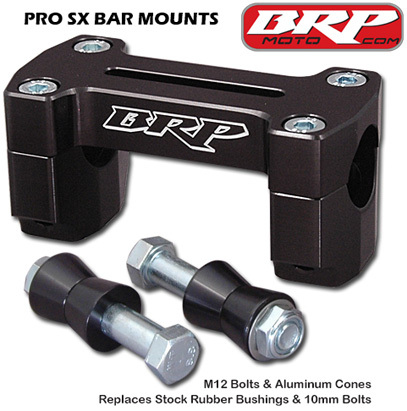 We recommend the BRP replacement handlebar mount shown below. Or you can machine the stock lower clamp as shown in this image.